For the third consecutive year, Puerto Portals hosted the internationally acclaimed ’52 Super Series’ competition at Puerto Portals Sailing Week 2017. The event, which ran from the 24th to the 28th July, welcomed nine boats from seven different nationalities. It brought together some of the best sailors in the world including Guillermo Parada, Vasco Vascotto, Peter Holmberg and Olympic sailor Jordi Calafit. The public was able to enjoy the regatta from the Sailing Lounge where large screens ensured none of the live action was missed. 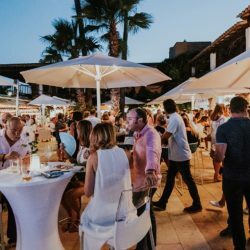 The daily competitions were followed each day by a ‘Happy Sailing Hour’ which featured live music performances and artists such as DJ Paula Serra and DJ Panela. The CEO of Puerto Portals, Corinna Graf, confirmed that they would continue to celebrate the international regatta in 2018 and 2019.